There are four basic types of security zones available for use, excluding smoke detectors, CO detectors, and flood sensors. Non-Entry / Exit Points Windows or doorways that end users will use to enter an armed premises. Exterior Motion Detectors Motion detectors on the premise grounds. 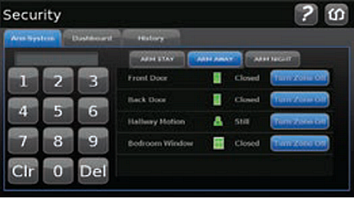 To manage Security Zones, from the touchscreen home screen, touch Security . Result: The Security screen displays. View the current state of each zone. Select Arm Stay, Arm Away, or Arm Night. Turn zones off or on by touching Turn Zone Off or Turn Zone On button. Zones that are turned off do not trip alarms when they are faulted. Fire / Smoke detectors, CO detectors nor Flood Sensors can be turned off. If any security zones are currently faulted, preventing the system from being armed, you must click the Turn Zone Off button for that zone before arming the system.